Have you ever felt Jesus’ message didn’t apply to you? One Size Fits All: How to Wear God’s Word reveals how the lessons of parables are meant for your life today. Each day you will Pick It Up, Put It On, and Walk It Out. The study is eight weeks long with five days of application each week to help you wear God’s Word. With the use of QR Code technology, you will be able to hear a message from Jennifer through your smart phone or reader without having to be near a DVD player. There is a new message each week. Don’t have a smart phone? No problem. The videos are available online. It’s time to see God’s Word is a perfect fit! Click below to purchase your book today. Click Here to download a condensed preview of Day 1 of this study. A perfect study for a men’s or couples Bible study group! Parables of the Master Storyteller is designed to draw the reader into the Word of God by sharing the stories Jesus told. Throughout the study, Jesus will speak His truth to you through a different parable each day. By reading God’s Word and answering application questions, Parables of the Master Storyteller will encourage and challenge you to consider how Jesus’ words apply to your life. Not only will you become more familiar with what Jesus said, you will also have a better understanding of how to live out His teachings. The study is 8 weeks long, 5 days each week. It also includes a Leader’s Guide for small group discussion. Christ has always played an important role in many women’s life. Today you face a whole new set of challenges as you work to find the balance between staying true to your faith and balancing work, family and everyday life. 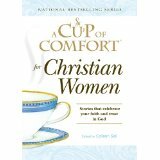 A Cup of Comfort for Christian Women features stories from ore than forty women whom Christianity still plays a large role in their lives as they navigate their roles as mothers, daughters, wives, sisters, and friends. From young women just finding their way to Christ to long-time believers who find reminders of God’s strength in the most unexpected of places, each story displays their courage through hardships – and infinite gratitude for the Lord’s gifts. Not only will this beautiful collection inspire strength and deepen your faith, you’ll also find the encouragement you need to preserve through life’s obstacles from women who have been there and understand exactly what you’re going through. Just as pearls are formed by irritations inside an oyster shell, God makes a pearl out of every trial and struggle in our lives. The Pearls of Promise devotional contains 120 “pearls of promise” from God written by authors from all over the United States. 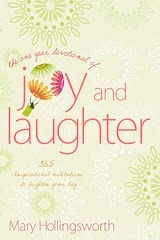 The contributors include best-selling authors LeAnn Weiss, Lisa Buffaloe, Beth Shriver, and Jennifer Mersberger. The project was co-founded by Christian motivational speaker and former national television sports reporter, Lisa Burkhardt Worley. 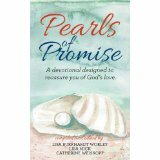 These honest and personal stories or “pearls” were written to encourage women in their faith journey. Pearls of comfort, encouragement, faith, truth, trust, love, joy, peace, praise, prayer, forgiveness and wisdom; let our “pearls,” born out of trials and struggles, speak directly to you. The Pearls of Promise devotional is a “go to” resource when you need inspiration from God because he has a priceless “pearl” waiting for you. What “pearl” do you need today?